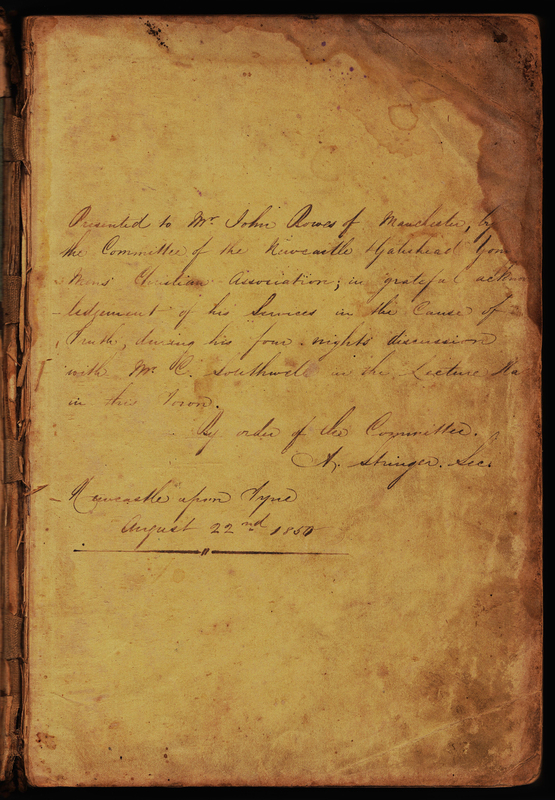 Bible (showing inscription) presented to John Bowes by the Newcastle and Gateshead YMCA on 22nd August 1850, after the public discussion held between himself and Charles Southwell. John Bowes, an English travelling preacher, was born at Swineside in Coverdale, parish of Coverham, Yorkshire, on 12 June, 1804. He was converted in 1817 (age 13), after reluctantly attending a sermon by a local Methodist preacher in Walls’ long room, Carlton, at the insistence of his father. He joined the Wesleyans and after 4 ½ years decided to join the Primitive Methodists in December 1821 (age 17) after hearing the Primitive Methodists in Carlton and Middleham earlier that year. The Primitive Methodists greatly appealed to him and from his autobiography (page 11), he states: “I loved them for their zeal in the cause which they had espoused”. He started preaching locally, and was approved to join the Guisborough Circuit after a committee heard him preach a trial sermon at Middleham in 1822 (age 18). In 1823 he joined the Ripon Circuit, spending 2 years there before joining the Keighley Circuit in 1825. From his autobiography (page 33): “Great Revival in Keighley Circuit [The following mostly appeared in the ‘Primitive Methodist Magazine’ July, 1826. As this is my first appearance in print, I took some interest in it, and believe it was for the Lord’s glory, not mine. ]” He then goes on to describe events from 5 November, 1825 to 12 March, 1826 which was submitted from his detailed journal. He married Susannah Bellwood at Thorganby on 3 September, 1826. On 25 May, 1827 he set off for the Sunderland Circuit, arriving in Edinburgh on 7 July, 1827. 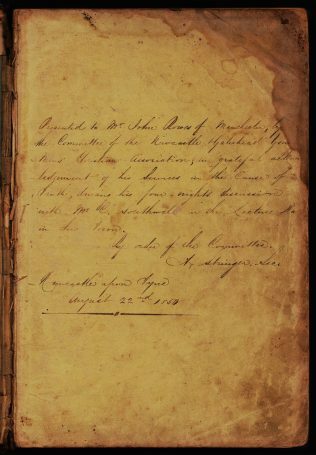 An intricate sequence of events leading to a dispute that he refers to as the “Controversy with the Sunderland Committee” resulted in John Bowes leaving the Mission in April, 1829. Thereafter, he renounced all party appellations and on 20 April, 1831 started a new mission and was inducted to the pastoral charge of the first church of the Christian Mission in Dundee. He subsequently left Dundee, becoming the pastor for Hope Street Chapel in Liverpool. He left Dundee with regret; 2000 people attended his open-air farewell sermon on 17 April, 1837. He travelled and preached often wherever a congregation was willing to listen, be it a chapel, a hall, a tent, a house, a fish-market or in the streets, in the ‘open-air’. For a large part of his life he was an itinerant minister and suffered many privations during his extensive travels through England, Scotland and Wales. He also visited Ireland, Canada and America. He studied the Greek language for 44 years. From his autobiography (page 80): “Those who expound the Scriptures, especially the New Testament, should, if possible, draw their streams from the original fountain, or they must depend upon others for uncertain supplies. I soon became able to give the sense of the original in sermons and lectures, and ultimately commenced, with a few others, a class at Cheltenham, for reading the Scriptures of the New Testament in the original”. This eventually resulted in his own translation of the New Testament from the purest Greek which he published in 1870. He published many of his writings. Some of his works (including his autobiography) were printed by ‘Bowes Brothers Machine Printers’ in Dundee, which was owned by his sons. In 1839 (age 35), he gave up taking a salary for preaching, choosing instead to support himself and his family with the sales of his writings, as well as lecturing. Blessed with a powerful voice, he was a passionate speaker and was more than willing to engage with “Infidels” and hold public discussions with socialists, freethinkers, atheists, Mormons, Unitarians and Roman Catholics, amongst others. He spoke out strongly against war and delivered a speech to that effect in the Free Trade Hall in Liverpool on 17 February, 1846. His peace initiatives led him to be one of the representatives of England at the Brussels Peace Congress on 20 & 21 September, 1848. In 1853 he wrote a letter to the Czar of Russia, admonishing him for his aggression at the start of the Crimean War. 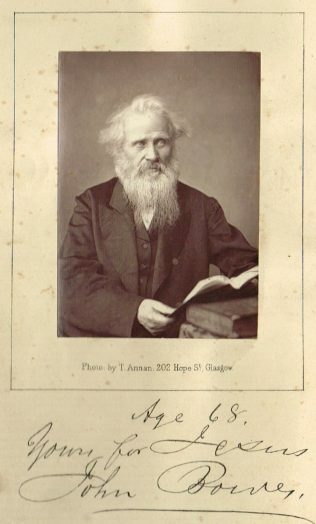 John Bowes died at Dundee on 23 September, 1874 (age 70). He was interred at Dundee Western Cemetery. John Bowes has his own Facebook page. You can visit it here. 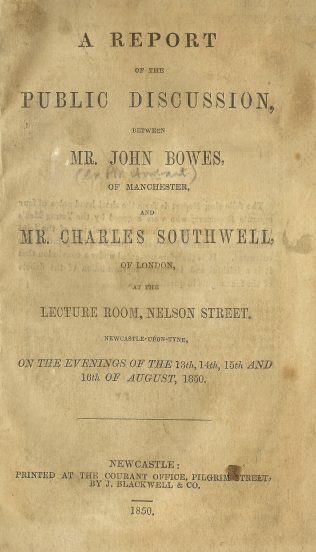 ‘Presented to Mr. John Bowes of Manchester, by the Committee of the Newcastle and Gateshead Young Mens’ Christian Association; in grateful acknowledgement of his Services in the Cause of Truth, during his four nights discussion with Mr. C Southwell in the Lecture Hall in this town. By order of the Committee. A. Stringer Sec. 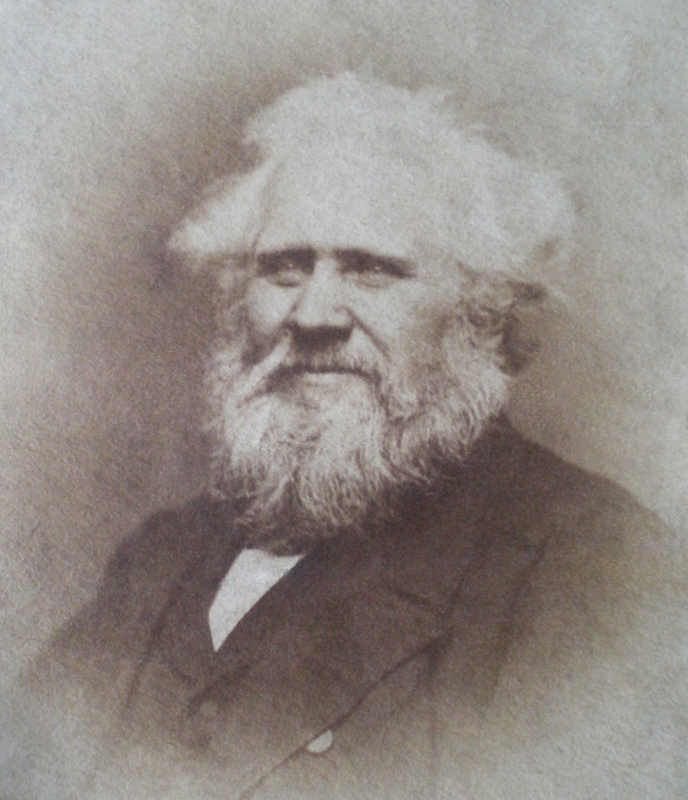 A photograph of John Bowes in 1872, from his Autobiography, has been added to this page. He also provides the following references in the Primitive Methodist Magazine 1826/242; 1827/26.